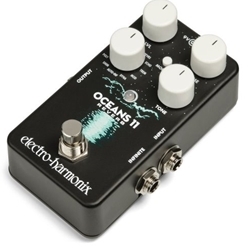 The Oceans 11 features powerful, yet intuitive “hidden” parameters accessible through its Secondary Knob Mode that let the player take greater control of its effects. An internal Tails switch also provides a choice of whether the reverb effect fades out naturally or stops immediately when the pedal is switched to bypass. In most settings the pedal is also capable of producing infinite reverb which can be played over with a fresh reverb effect complete with adjustable parameters!